Like many other cities, Brisbane has a Chinatown. Our Chinatown precinct is in Fortitude Valley, and is surrounded by a myriad of restaurants, with oriental produce, jewellery and health stores to add to the mix. 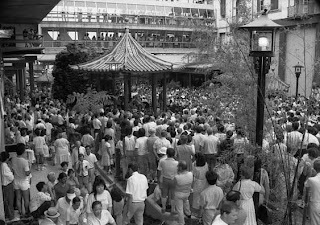 Chinatown Mall was officially opened by then lord mayor, Sallyanne Atkinson on 29 January 1987 - just in time for Chinese New Year celebrations for the year of the Rabbit. Kung hei fat choy! Here is a picture of the hordes of people who turned up on opening day. The mall has had a varied existence since then. It was very popular for a time, and then business waned. Many Chinese immigrants have chosen to live in the southern suburbs of Sunnybank and Robertson, so the trek to Fortitude Valley is a rather long one. Those suburbs now have their own Asian flavour and attract large numbers of people. The Fortitude Valley Chinatown had a makeover in early 2010. 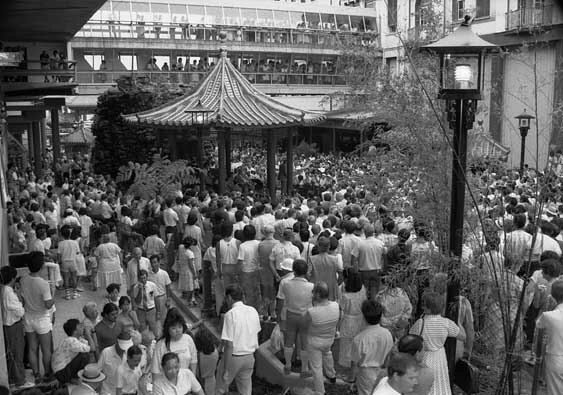 Some $8 million was spent to reinvigorate it, but the renovations themselves were not popular with the local traders because the noise and dust kept patrons away from the area. Delays in completion added further frustrations. Once finished though, the area took on a more authentic look, thanks to input from Chinese architects. Here are a few photos. The lions at the entrance to the mall (top picture and close-up in last picture) are reported to weigh 320kg and sit there to prevent evil spirits from entering the area. They were a gift from the People's Republic of China. You should check out the site of Brisbane "original Chinatown" 1888 riot on Albert Street. Very interesting.